This morning I was alerted via a tweet from Viking (@VikingRange) that today is National Pumpkin Day. I wasn’t planning on sharing this recipe until mid-November, closer to Thanksgiving, but with this being the day of the Pumpkin and Halloween less than a week away (I can barely believe it) it’s only appropriate that I post something pumpkin-y today. This recipe comes from Dorie Greenspan’s Around My French Table, and is the very dish that drew me to place her book on my wish list in the first place (it only took me about ten months since receiving the volume to make something — ok, besides a list of recipes to try — from it). 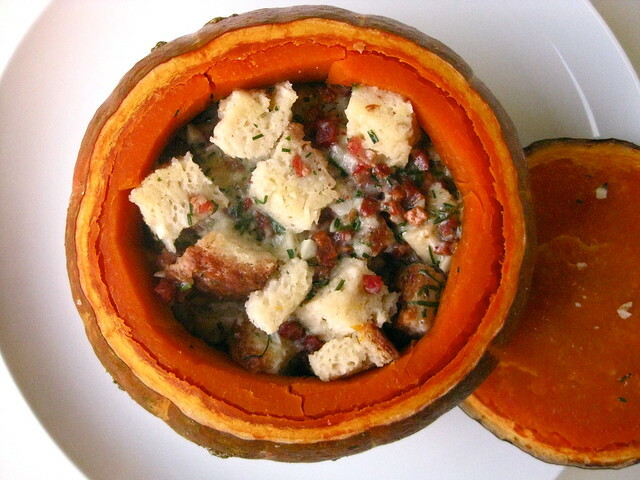 If you enjoy savory applications of winter squash plus bread, cheese and cured pork, this recipe is for you. While you could eat it as a main dish by itself, albeit a rich one in my opinion, it’s fantastic paired with a simply seasoned roast (whole chicken, pork tenderloin, etc.) and maybe something green (the squash counts a vegetable though, right?). I also have a sneaking suspicion that a couple small, halved acorn squash would make for adorable, personal-size versions of this dish (please let me know if you try this out, I’m so curious!). I can’t think of a better way to celebrate National Pumpkin Day than with this beautiful (and tasty) fall meal centerpiece (that is unless you prefer to commemorate the occasion in a sweeter way, with a dozen Pumpkin Spice Cupcakes). Preheat oven to 350°F, place a sheet of parchment or tin foil on a small sheet pan. Cut top off pumpkin and scrape out seeds and strings, rinse and pat dry. (I cut it straight across with no issue. You could also cut it as recommended at a 45° angle.) Sprinkle salt evenly over the pumpkin’s surface; set aside, allowing salt to draw out some of the pumpkin’s moisture, while you prep the other ingredients. Preheat a small skillet over medium heat. Once hot, cook pancetta until crisp; drain on paper towel-lined plate. Combine crisped pancetta through spices in a medium bowl. Fold cubed bread into cheese and bacon mixture. Pat salted pumpkin dry then sprinkle surface of pumpkin with black pepper. Spoon bread mixture into the pumpkin, pack filling down lightly; cover with pumpkin top and place on prepared sheet pan. Transfer baking sheet to center rack of the preheated oven and bake for 1 1/2 – 2 hours or until pumpkin is tender and filling is hot through to the center. If the filling is too liquid-y, carefully remove top, increase oven temp to 450-500°F sprinkle with additional gruyere (optional) and bake until the liquid is cooked away to your liking (timing will depend on how much liquid you’re dealing with, keep an eye on it to prevent over-drying and -browning). Allow pumpkin to rest for about 10 minutes² (with the lid on) before removing lid, transferring to a serving plate and slicing into wedges. ¹ I used Kabocha Squash. I chose it for its size, appearance, price and flavor. For some other more unique pumpkin options, see this list from Sunset magazine (some others can be found in the September 2011 print issue, too). ² I needed to keep the pumpkin warm while my chicken cooked (I roast a butterflied chicken at 500°F, so a lot hotter than the pumpkin bakes at), so I kept it on its baking sheet and placed it on the burner that the oven vents through (back right one) to keep it hot before serving. Stunning photo! I’m posting the same dish on Friday…and LOVED it! Lizzy: Thank you! So happy others are getting the word out about this tasty (and festive) dish! healthyfoodietravels: Thanks! It’s such a unique (I’ve rarely had savory winter squash dishes, mostly just pastries) and wonderful combination — practically addictive! Pumpkin Day. I wonder how this came to be? I love pumpkin any which way. This looks good. I will try it, but tweak a bit by using healthier ingredients – uncured bacon ’cause of my health issues) and whole-grain bread. raquel: I couldn’t agree more, I’m making it again this weekend — thanks for stopping by! yolanda: That’s a really good question; I love pumpkin (like you) so I’m happy to celebrate it any old day :). I hope you enjoy it with the changes. I do recommend that you use a heartier (non-sandwich loaf) type of whole grain bread — it needs some substance in order to hold up to the pumpkin’s moisture. This pumpkin really is stuffed with all things good! Wow…. So pretty too! Thanks for linking up to the All things Pumpkin!